November 7th saw the return of J.D. and the Sons of Rhythm to the Roadhouse Theater. 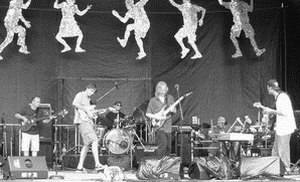 After finishing the recording of the tracks for the upcoming CD Quantum Events, and playing Erie's annual Jazz and Blues Festival at Frontier Park, the Sons were ready to settle back in to the now-familiar stage for some serious fun. Setting up for the gig was as chaotic as ever, with last-minute trips to Radio Shack (thanks, Randy) and eight musicians all coming and going at different times. Rod Schafer of Catwalk Music did the sound reinforcement, bringing together two electronic drum sets (J.D. and Jayson Hopkins), an acoustic set (Rickie Hopkins), congas (Joel Polacci), two guitars (Sheldon Peterson and Mike Ohm), a channel of guitar, guitar-synthesizer, and keyboards (Frank Singer), and electric bass. Midtown Recording Studio engineer Randy Hetherington filled the bass chair for the first time this performance, jumping into the music as if he had always been there. J.D. began the first set, playing a groove that set Jayson, Rickie and Joel in motion. Randy quickly found a bass line to go along, and the music began in earnest. As ever, the music is spontaneous, flowing from one idea to the next, and one soloist to the other, sometimes together, and sometimes with nothing but groove. The Sons of Rhythm play together almost instinctively, forming rhythms and counter-rhythms in an on-going dialog. The nature of the music's creation produces pauses, moments of listening and change. At times, it is as if a breath is taken, a meaningful silence between paragraphs. With the kind of audience that is following the music, the difference in their reaction tells the difference between the musical silences, and the end of movements of music. After a few such movements, a long first set comes to a close. All the musicians in this group come to play wherever and when-ever they are. Guitarist Mike Ohm (Best of Erie, 2003) led the way in the second set, with Potato Battery partner Sheldon Peterson responding in kind. Frank Singer chimed in for keyboard and guitar solos, introducing the sound of trombone, classical guitar, violin, and other sounds through the use of the guitar-synth. Two- and three-way exchanges between soloists increased the intensity of the conversation, and the rhythm section supported the effort perfectly. The group played hard for the second set, giving another hour-long set to an appreciative Roadhouse audience. J.D. and the Sons of Rhythm express much gratitude for the return performance. The Roadhouse Theater is a very comfortable place to perform, and J.D. and Sons seem to fit right in. For now, we await the pending release of Quantum Events. One of the best things about doing the CD duplication is that I get to hear the final product right after it leaves the studio. Tonight as I sit down to work on making all this music available to everyone, I am listening to the master of Quantum Events, the new double CD from J.D. and the Sons of Rhythm. It has been a while since we played some of this music, and there's just a lot going on right now for everyone, so I have forgotten the details of what we laid down over the last three or four months! I find myself smiling, and very pleased with the music I am hearing. First, a word to the band: you are going to dig this CD! Randy Hetherington's engineering, mixing and recording skills, and experience shine through, and the hand, mind and ears of producer J.D. Hopkins are everywhere, in everything from how the album starts, to leaving shouting in during one of the transitions. J.D. has, like all great visionaries, the ability to transcend the individual sessions, and even the individual players, and view the sessions as a composite whole, putting them together to tell an epic tale! One theme of this tale is the theme of a band growing tighter and more sure of themselves in this uncertain endeavor. Every member of this band was a great listener to begin with, and the focus on this skill that is required of J.D. and the Sons of Rhythm has refined and sharpened the collective hearing of the group. Soon, you will all be able to hear the soaring lines of guitarist and guitar-synth player Mike Ohm, the impeccable taste of guitarist Sheldon Peterson, the mad skills of drummer Rickie Hopkins, the flow and groove of electronic drummers Jayson Hopkins and J.D. Hopkins and the bass department with Tony Stefanelli, Kenny Cornelius, and possibly others (I haven't even heard all the tracks yet, and the listings aren't here!). Once again, J.D. and the Sons of Rhythm take music which has most typically been done in the recording studio, and moved it out into the live performance arena. This time, it is live at the annual Jazz and Blues Festival, held every August in Frontier Park. Once again, the core players were out in force, including J.D., Rickie and Jayson Hopkins, Tony Stefanelli, and the three guitarists Sheldon Peterson, Mike Ohm, and (doubling on keyboard and guitar synth) Frank Singer. Mambo's Ralph Reitinger joined in for a jam towards the end of the set, bringing Tony back for the last segment. Once again, the music starts when it starts, and each musician finds their place within it. A warm, sunny afternoon influences the music, and the response of the crowd at this annual Frontier Park festival warms the music even further. There are moments of gentle exploration, moments of commanding direction, and moments of delightful anarchy. Once again, it is vintage J.D., with new music coming forth from each musician, combining into a collective unit where each part has independent thought, yet acquiesces to the needs of the total sound. This group of musicians grows closer with each playing session, be it a studio recording, or a live performance, and the result is cohesion in a format that can be incoherent without the care that each player adds to the mix. Once again, the performance had to draw to a close, to make way for the next. Each time J.D. and the Sons of Rhythm has performed live, the response has been extremely positive. This day was no exception. The first time a new member of J.D and the Sons of Rhythm enters the recording studio, there is an uncertainty which can border on aprehension. It is the same feeling any musician gets when playing in a new place. And just like returning for gig after gig, coming back to the same studio has the same effect, one of familiar territory. In many ways, it's the little things. Each musician knows where to go now, and what to bring for their particular setup. As the core of musicians develops, with J.D., Rickie and Jayson Hopkins, Tony Stefanelli, Sheldon Peterson, Mike Ohm, Frank Singer, and Tuesday guest Joe Pop making up this ensemble, the relaxed feeling of being with old friends removes any remaining anxiety about what is to come. Gear is connected, headphone mixes are adjusted, and gradually the playing starts. The sudden appearance of possibility brings an instant state of alertness. Each player responds, finding sounds, feeling grooves, and allowing the music to react to the music. Like any routine in life, it often becomes the unexpected. Listening and following, imagining and leading, roles are exchanged as one niche fades and another takes its place. This is evolutionary music, visionary sensibility required, and what happens happens. Like J.D. getting behind a drum set for the first time in these sessions. Like Rickie moving over to the electronic drums. New avenues appear - free jazz followed by free-time funk, followed with world-beat five-four time. Sometimes one becomes the other, and sometimes they run paralell. And then - the time allotted passes, and one by one the players return to the routine. Friends exchange thoughts and ideas, plans are made for the next gig and recording session, and gear is dis-assembled and packed away. Even this ebb and flow of creativity becomes routine, a good thing, because it works the way it's supposed to in J.D. and the Sons of Rhythm. Most musicians spend the bulk of their time working with songs - compositions with structure, form, and predictable events. Many American musicians become comfortable with moments of spontaneous creation, in the form of solos and open jams. Some even experiment with free improvisation. Few become comfortable with it. And even fewer become comfortable enough to do it in live performance. Welcome to the easy-chair of free improvisation - J.D. and the Sons of Rhythm! On Saturday, May 31st, J.D. and the Sons of Rhythm once again embarked upon the adventure of starting from scratch - every time. This round of the ensemble included guest guitarist Sheldon Peterson, and a quick romp with Ralph Reitinger, bassist with opening act Mambo. Regulars Mike Ohm and Frank Singer were joined by the dual bass section of Dave Blaetz and Tony Stefanelli. Rickie and Jayson joined father J.D. Hopkins in the drums and percussion section, as they do in each performance and recording. After a rousing set from Mambo, J.D. and Sons began to set the grooves, with the ensemble conversing musically throughout. Guitarists Sheldon and Mike held the stage-right edge, next to bassists Dave and Tony. Sheldon, Mike and Dave all play in contemporary jazz group Potato Battery, and Dave and Tony shared the bass chair for much of Music From Another Planet, so this was a very comfortable stage side. Rickie held the center stage, next to brother Jayson, with J.D. stage-left of the Sons. Guitarist, guitar-synthesizer, and keyboardist Frank took the hard left, leaving an opening to be free to roam. Throughout the journey, various pairings and combinations seemed to occur like quantum events, with probability becoming reality as notes are played that, in retrospect, seem inevitable. Trading fractal passages of dialog, a common occurance in Potato Battery, expanded scope to include longer trades and more participants. Dave and Tony held down the bass, and the middle too. Both contributed to the discussions as soloists as well, taking over the top for a bit. The Hopkins family held the grooves, introducing multiple layers of patterns, interlocking to provide a fabric of sound. Textures change to suit the moment, and once in a while Rickie took the center stage of the music, and demonstrated his evolutionary style, ever-present in the jams. The group played two sets that evening, feeling very comfortable in the Roadhouse Theatre. The informal atmosphere mixes very well with the roomy and well-equipt stage, and J.D. and the Sons of Rhythm settled in quite nicely, thank you! The staff made the group feel welcome, and J.D. and Sons look forward to being back on stage at the Roadhouse Theatre very soon. Even as J.D. prepares for the CD release party for Music From Another Planet at the Roadhouse Theatre on May 31st, more music is already recorded, and more sessions are in the works! During the last week of April, and into the first day of May, Midtown Recording once again filled with muscians ready to use their finely-tuned musical reflexes to create spontaneous music. The core musicians for this session included Mike Ohm, Frank Singer, and Tony Stefanelli, as well as J.D. and sons Rickie and Jayson Hopkins. The recording session sextet was joined by guests Joel Polacci and Sheldon Peterson on various evenings. Randy Hetherington took the helm of the studio as usual, and navigated successfully through another J.D. session. Each of these recording sessions has had a unique feel to it. Perhaps due to entropic forces, or the turbulence of the times in which we live, or factors undefinable, this session had a frenetic energy that was almost hard to direct. "We found ourselves playing harder, jumping in faster, and building more intensely", states one session musician. J.D. describes it this way. "Usually one of us stays in the groove and the other ones play off of it. This time there were moments when we all left the groove, and entered into one large syncopation!" The result is another set of tracks unique in its inception and execution. Hard jamming and focused soloing create an edginess to some of the tracks that bring the listener into a new space, carried along on an intense ride. Was it all frenetic chaos? Of course not, says J.D. "There are always thoughtful passages of harmonious blendings when these musicians play. We have a full range of playing skills and experience, and an equally full range of expression with this group." That shows, even through the frantic passages, as it does on each of the previous releases, Primate Gestures and Family Values. These tracks will join others to become the next J.D. and the Sons of Rhythm CD. With the addition of each unique session, the coloration of the final result will be more and more diverse. Is it hard to keep spontaneous music interesting? "Depends on the players." says J.D.. "In this case, not at all." For a few years now, J.D. has been gathering other musicians together with him and his sons Rickie and Jayson. This began with studio projects resulting in Jammin' at Midtown, Family Values, and Primate Gestures. The success of the spontaneous nature of the recordings led to the thought that the same freedom could be accomplished live. Friday, January 31, 2003 marked the third successful performance by this group of musicians. Of particular note is the use of two bass players for much of the jam. This concept will also be featured on the next release Music From Another Planet, with J.D. Alumnus Dave Blaetz joining Tony Stefanelli. Dave could not be present for Friday's gig (we missed you), but Tony hit it off with Kenny Cornelius just fine! All three bassists will be featured on the upcoming release. The evening began with J.D. and his sons Jayson and Rickie, who made his way to the drums via a brief, exciting interlude on the keyboards. After all three Hopkins were on drums and percussion, the other members of the ensemble made their way to the stage one by one. With various pauses between movements, the group continued to play for another hour, exchanging ideas, solos, rhythms, and musical conversation. An appreciative audience provided their feedback in the form of applause and attentiveness, and the band took a break. Mike Ohm, Rickie, and Kenny Cornelius started out the second set with a power trio. Hitting it fast and furious, they generated the intensity level for the rest of the evening. After their dynamic jam, the full crew re-took the stage to add their own comments to the discussion. Guitarist Scott Cravener, percussionist Joel Polacci, and guitarist / keyboardist Frank Singer rounded out the compliment of musicians. Experimental improvised music is alive and well in Erie, PA, and can be found right at Forward Hall. It can also be found on disc, on Primate Gestures and Family Values. J.D. and the Sons of Rhythm will be back, to Forward Hall, and to disc with the upcoming release of Music From Another Planet. During a cold week, in a cold season, in a cold climate, musicians trickled in one by one to Midtown Recording Studios. It was early January, the week after the holiday $ , and J.D. and the Sons of Rhythm were ready to play. Studio engineer Randy Hetherington was there to capture all of it on 24 track hard-disc. For four evenings the band played. Sheldon Peterson paid us a visit for an evening, and had quite the musical conversation with Potato Battery co-writer Mike Ohm. Scott Cravener kept his amp by the bathroom, just in case. He stayed in the control room, where it was warm. Tony Stefanelli and Dave Blaetz joined basses for two evenings, and Tony and Kenny Cornelius each had a night to themselves (in the sub-tones). Frank Singer joined J.D., Rickie and Jayson in the drum room, and away they went. Spontaneous music was the result of this journey through the unknown. Listening to each other, and feeling their way, the collective forms the music from the interaction between them. It is the way musicians get to truly know each other - through their playing. At the end of it, J.D. and the Sons of Rhythm know each other quite a bit more. At the end of this chilly week by the Great Lakes, as the musicians file out, tracks await. As of this writing, Music From Another Planet is scheduled for release this spring.